Tuscany Villas – Live Like a Local – The Great Canadian Travel Co. 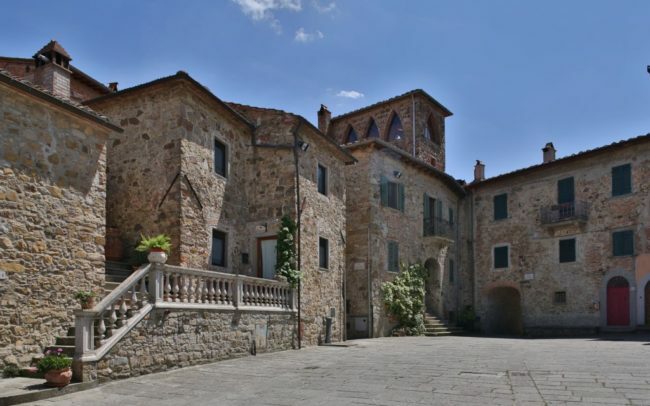 Experience an intimate and authentic Tuscany in a 16th century villa in a 1000-year-old medieval village. Your villa is your base to explore this gorgeous area and your private guide will show you the wonders of Tuscany. For high season – June 16 to September 15 – please inquire for pricing. Prices and taxes are shown in CA$ per person, based on the number of people indicated per property. Actual pricing will vary depending on the currency exchange in effect on your day of reservation. Prices are subject to change should additional taxes or fees be assessed by the supplier or governments. Choose from one of four villa units, completely remodelled and outfitted with all modern amenities on the inside, all nestled within a 500-year-old villa. Upon your arrival, you will be warmly greeted by the owner who will spend about 2 hours with you walking through the village surrounding the villa. You will be introduced to the barista, baker and butcher – all meat & eggs come from the village, pharmacist, bar owner and will be provided with maps and brochures from the surrounding area. You are encouraged to wander and immerse yourself in the local culture. Ask all the questions you want, the owner knows this area very well and can plan a great Tuscan adventure for you during your stay. Nestled amongst the trees on a hilltop in the middle of the triangle that is Siena, Florence and Arezzo, you will find this quaint historic village. 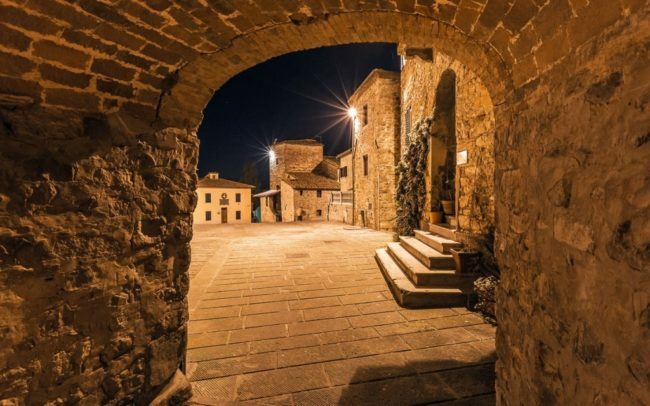 Be enchanted by the charming atmosphere and friendliness of Pergine Valdarno, the kind of place where locals call out a cheery “buongiorno” when you pass them. 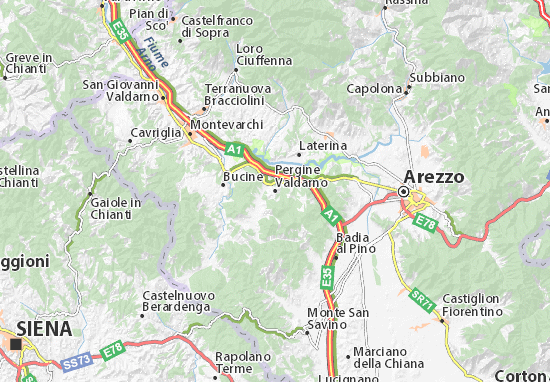 It is cradled in the midst of the “golden triangle” between Siena (50km), Florence (64km) and Arezzo (20km) – an area of historic strategic importance that was hotly contested through the centuries. Today, it’s ideally situated to give great access to those three important art and cultural capitals of Tuscany while retaining its small-town appeal. 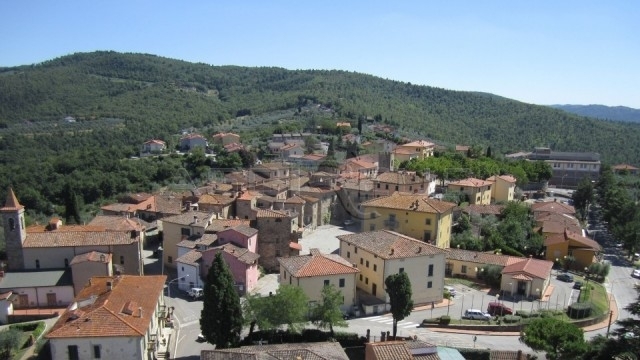 The views from town are breathtaking and quintessentially Tuscan with golden-lit hills covered in olive groves and vineyards as well as woods. Spend a day as your guide whisks you away through the valley surrounding the village. Step out into history as you make your way through the valley. Your host can take you on full day and half day tours during your stay. You will be departing from your villa in the morning and will be taken care of you until you return in the afternoon/evening. During the day, you will have a chance to explore the famous sites, but your guide will also take you on a tour of the lesser visited sites as well. Keep your camera ready to immortalize the memories of the beautiful scenery rolling by. You will be escorted to savour a local lunch in a charming, authentic Tuscan café (independent to price). Explore the medieval city of Siena through vibrant streets with its many restaurants and delis. Visit the Gothic architecture of the Duomo, Siena’s cathedral which was constructed in 1215. Grab a gelato from one of the many cafes as you stroll through the city’s historic districts. 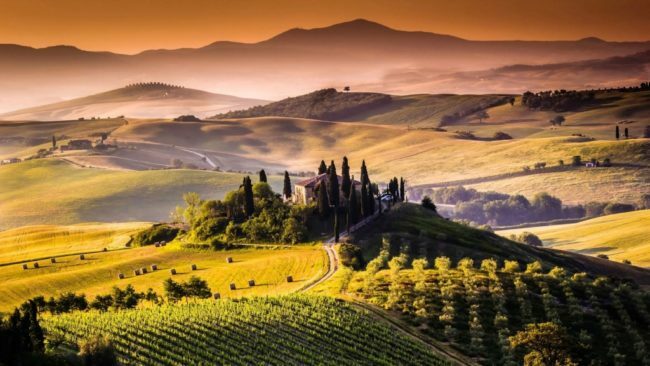 Fall in love with Chianti as you tour around this unique landscape filled with vineyards, olive groves and small stone villages. The tour is already planned, all you are required to bring is your adventurous spirit and a desire to be immersed in the local culture. Any personal interests or focus can be easily integrated. Wrap yourself in the local culture by tasting your way through the village around the property. Sip the local wine, nibble on the locally made cheese and ice cream and other local products directly from the places these products are made or savour them in the local weekly market. This tour is usually planned for the afternoon, but can also be planned for morning or early evening, depending on the desired activity. You will have some free time to explore on your own while you are here so make the most of this time and go for a stroll around the local markets and meet the local artisans. Gaze out onto the beauty of the valley below while sitting on the village terrace. Sip on freshly brewed coffee while you meander through the streets. Meet the town butcher and nibble on tasty prosciutto after tasting some locally made cheese at the market. 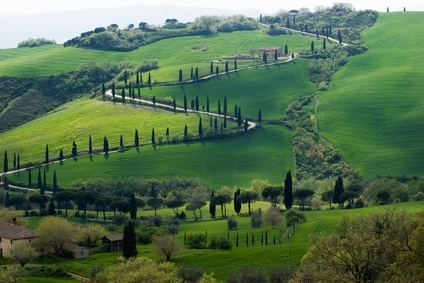 Wander through the olive gardens with no sense of urgency as your mind focusses only on the beauty that is Tuscany. Breathe in the smells of freshly baked bread while your taste buds erupt when they experience fresh olive oil for the first time. Taste and see what Pergine Valdarno has to offer you. For an experience to bring home, partake in the family Italian cooking class at the host’s villa. The class will start at 6pm and a menu using local seasonal products will be prepared with all the guests in the villas. Get to know your hosts and the other guests while you prepare and enjoy the fruit of your labours after preparing this feast. Try your hand at some antipasti, some pasta or other simple authentic Tuscan/Italian recipe, and, of course, a dessert. 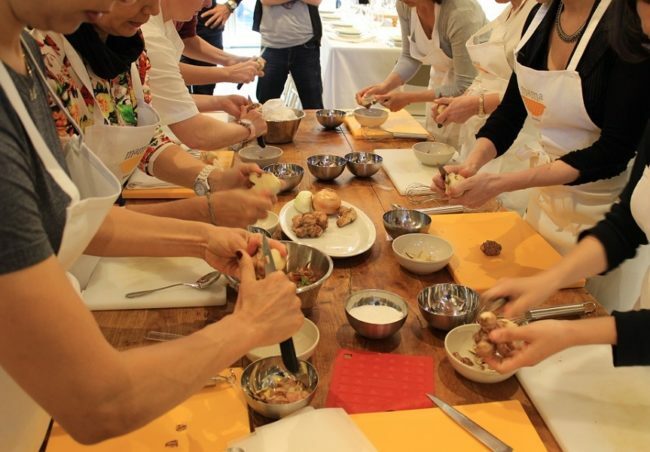 Not only do you learn how to prepare these dishes, but you will also be given the recipes to take back home with you. Breathe deeply and take in the history and beauty that is this stunning villa for 2. Restored and renovated while keeping the traditional Tuscan culture in mind. 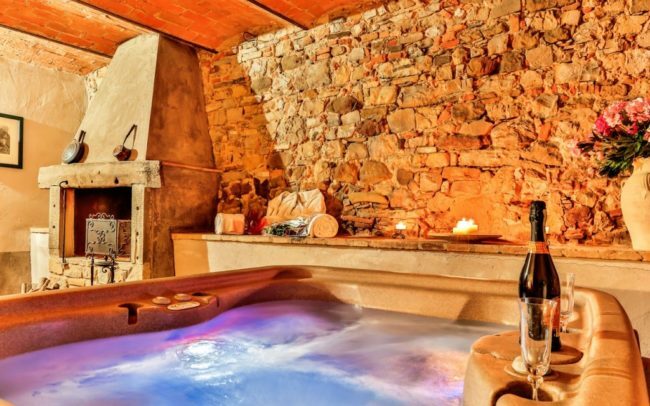 Sink deep into the hot tub with a glass of wine and a roaring fire in the background and feel the stone and solid wood beamed ceiling above you as you relax. Bask in the warmth as you relax and feel the stresses of home melt away. Draw in the peacefulness of this private villa while you explore the romantic spaces in this exotic Tuscan villa. The bedroom, which looks like something from a fairy-tale, boasts a classic four-poster bed, comfortable enough to lose yourself and spend a honeymoon, anniversary or whatever you may be celebrating. This 2 level, 3 bedroom, 2 bath villa is located in the centre of Pergine Valdarno. The fully-equipped kitchen has a fireplace and a large antique table that can host up to 6 people. From there, climb the original stone staircase to the second floor where you’ll find two of the bedrooms and one bath. The house boasts the same wooded ceiling and stone that adorned the villa from the beginning. Sit on your private terrace with a glass of wine and watch the village go by. Able to preserve the majority of the original 16thcentury structure, the Casa Di Vignolo has all the modern amenities with the charm of centuries gone by. Enjoy a book and a glass of wine while sitting in front of a fire in the original fireplace in the large living room. On the second floor, 2 bedrooms with a towering ceiling receive the warmth of the sun through a skylight. All living areas are equipped with air conditioning for those humid summer days. This villa has 3 bedrooms, 3 bathrooms and a fully equipped kitchen. Breathe in the Tuscan air while sitting on the porch outside and greeting the locals as they walk by to get a coffee in the morning. Listen to the church bells chime at 8 and 8:15 to remind the children that school is about to begin. 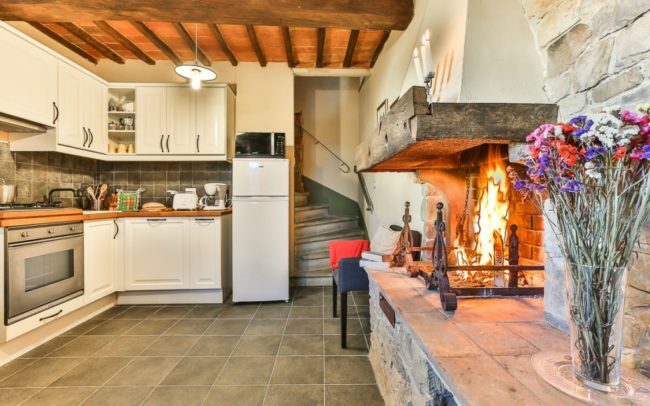 One of the oldest houses in town, this 3 bedroom, 4 bath villa is perfect for 3 couples or a family wanting to experience the historical village of Pergine Valdarno. A stunning piece of history beneath your feet, the Villa Fracassini spans two floors with bedrooms upstairs and the living area downstairs. Each bedroom has an ensuite. An interior elevator allows those with mobility issues the ease of moving between floors; an external staircase connects the floors as well. The private garden provides you with a chance to take a dip in your private pool (pool is open May 1-September 30). 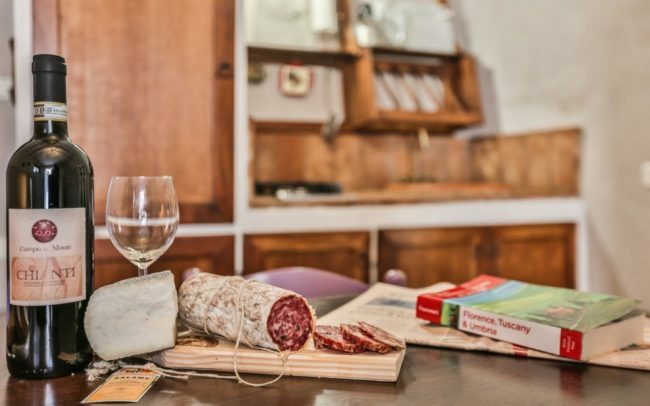 Savour a traditional Tuscan meal, that you’ve prepared in your fully equipped kitchen, outside in the gazebo overlooking the beautiful Tuscan countryside. Full Day or Half Day Private Tours – add additional tours to your program which can be customized to suite your interests. Just let us know what you are interested in doing and our local guides can put together a private tour that will be “just right”. We can arrange for a car rental from your airport of arrival, with a drop off at your airport of departure. All sizes of vehicles are available. Certain restrictions apply as far as one-way rentals and driver’s age. We can offer you an exact quote once your flight details have been confirmed. Private transfers from any airport or train station to/from the villas can be arranged in advance. 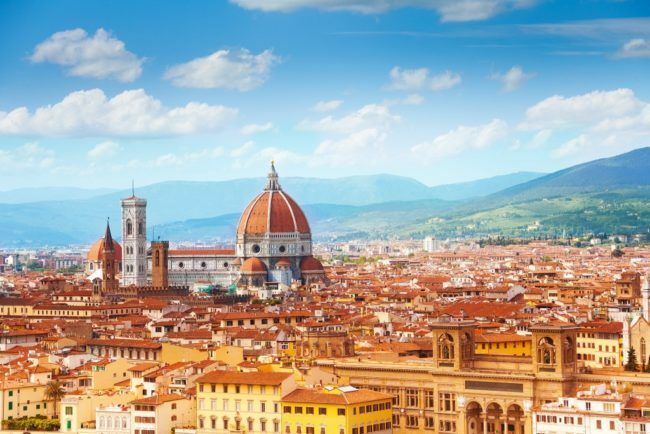 After a 45-minute train ride through the beautiful Tuscan countryside, a private guide will meet you in Florence to help you explore this overwhelmingly beautiful city and all it has to offer. Let the many sights, sounds and tastes of Tuscany’s capital city seduce you. Stand in awe of the many cathedrals, museums and the multitude of famous artworks that adorn the walls and spaces in and around the city. Gaze at the Palazzo Vecchio Tower and the Bardini Garden. Pay your respects to the most illustrious Italians at the Santa Croce; This is the burial place of Michelangelo, Galileo, Machiavelli, Foscolo, and Rossini. Catch your breath in the church, abbey and cemetery of San Miniato. Stare in awe at the breathtaking detail of Michelangelo’s masterpiece, ‘David’ in Florence’s Accademia Gallery. Soak up the views of the Arno River as you cross the Ponte Vecchio bridge into the Piazza della Signoria, Florence’s main square. This is where you will find the Palazzo Vecchio, the town hall. Take time to admire the wide arches of the Loggia dei Lanzi. Lead with your taste buds and savour your way through Florence’s markets and small artisanal food and wine shops. Explore the hidden gems that only locals know about. Savour each stop as you taste your way through the city. For all those who dream of cycling through Tuscany! 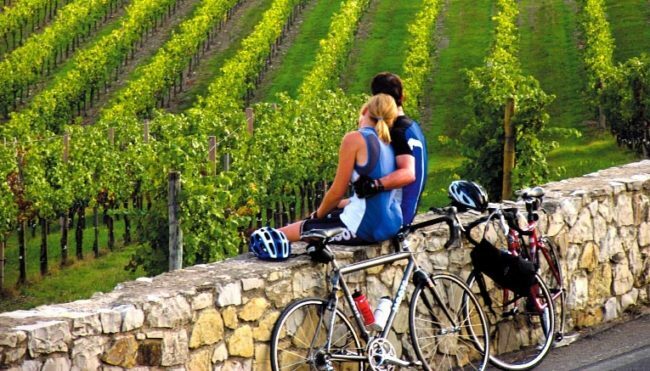 With or without a guide, see the sites around Pergine Baldarno by peddle bike or e-bike. With your own feet, or with the ease of a motor, seamlessly glide up and down the hills surrounding this picturesque villa.